Live Maine lobsters delivered fast & fresh from our dock to your doorstep! Our live Maine lobsters are available in all sizes from the cold Atlantic waters off the coast of New England. 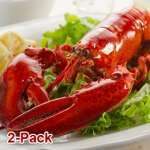 Whether you are looking for a single restaurant sized 1 1/4 pound lobster, a premium 2+ pounder, or the always impressive jumbo lobster (4 pounds and up) we’ve got you covered. Lobsters New England is your source for the best tasting and finest live Maine lobsters!